Chaos Ex Machina: Security from Obscurity? The complexity of technology seems to be overwhelming society. We have put computer systems a million times more powerful that the systems that put a man on the moon in the pockets of children and teenagers the world over. Quite literally, we have the combined knowledge and learning of the last 70 million years of science, evolution, progress, and development at our fingertips, each and every day. However, in the process of driving this technology to market we completely failed to think about how we are going to keep the information and the people using it, safe. It's obvious that the way security is being handled now is not working, and it needs to be looked at in a whole new way. 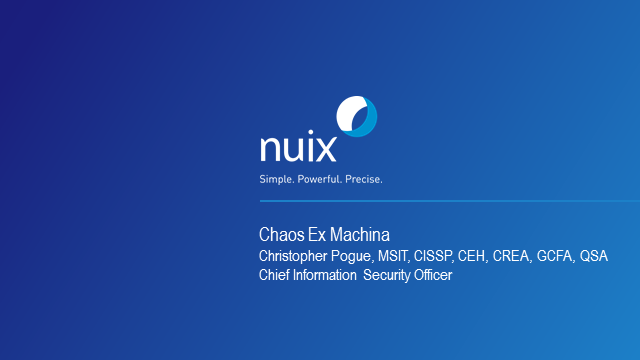 In this webinar, Chris Pogue, Chief Information Security Officer at Nuix will describe what the next generation of security needs to look like not only to address the evolving threat landscape, but to also encompass the continued growth of the Internet of Things and the continued evolution of technology into our daily lives. Title: Chaos Ex Machina: Security from Obscurity?